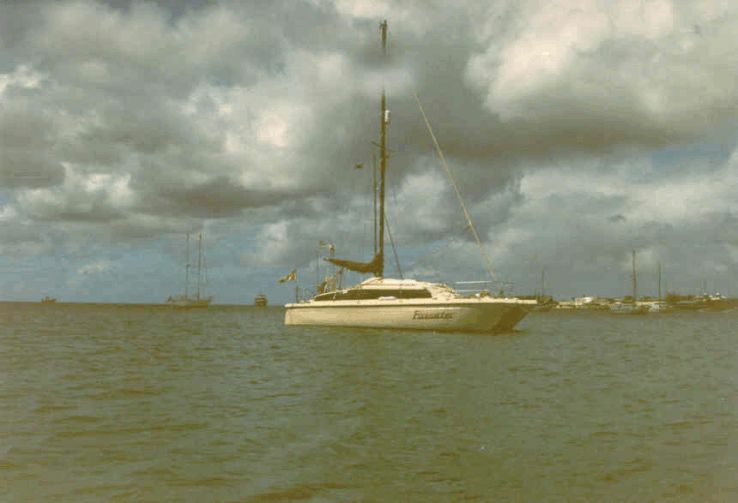 Firewater is the story of a doomed voyage and is based on my memories, diaries and logbooks. I make no apology for my account of dealings with Trout Catamarans: journals and other supporting documents vouch for the accuracy of my record of business with that company. Although my book is based on real events and people, I have drawn heavily on my imagination when writing it, and both the actions and the characters described should be considered purely fictional. Like the potent spirit for which it is named, my book Firewater should not be taken recklessly nor swallowed literally. Although it may appear otherwise, and I have great respect for those who have had the courage to take up arms against oppressors when all peaceful means have been exhausted, I have taken no side in the partisan disputes reported on these pages. Neither do I approve of militant action which sheds innocent blood. My twin brother Liam, who shared much of this adventure with me, is a real person, although I may have exaggerated his marital discord and his monumental egotism. But only slightly. I have some doubt, however, about the degree to which some form of insane delusion or chemically induced hallucination may have inflamed my recollections of that ill-fated venture. Liam, certainly, has described my book as the product of a diseased mind. The young man at the wheel swallows, bobs his head in acknowledgment of the rebuke, then readjusts his glasses before returning his gaze to the river. He takes off his thick spectacles, breathes on them, then gives them a quick polish with the end of his tie before resuming his anxious stare through the windshield. Those signs of panic and indecision go unobserved by Captain Grimes, who has returned to his discussion with the river pilot and the radar technician, nor does he glimpse the small yacht, now masked by the bows of his ship. Blinded by some part of the ship’s structure, or because of a flaw in its electronic retina, the radar also fails to detect the small yacht. Aboard the sailing yacht, her new owner, concentrating on the channel ahead, strives to ignore the overtaking monster. Such a large ship will surely have a radar; he’s probably spotted me long ago. I’ve left him at least half the channel anyway, plenty of room to pass. Such thoughts, however, failed to convince me. The fact was, I didn’t know what to do. If I turned to port, it would be a contravention of the rules of the road, and might just place my new yacht in the path of the large ship when it swung out to pass. If I continued straight on, the huge craft might run me down. On the other hand, a starboard turn would put me out of the channel and into a mysterious region marked “overfalls” on the chart, away from the line of buoys which afforded my only reliable means of navigation. “Well, are you going to wait to be run over, Ned, or are you going to get out of the way?” The lofty inquiry, cold derision in its tone, coming from the other occupant of the cockpit, decided me. “I am going to continue keeping to the right of the channel, and allow them to pass on my left. I do have the right of way, and I am sure they are aware of that.” One does not allow oneself to be talked down to in one’s own boat, even if the disrespectful crew member happens to be one’s brother, and that brother happens to be older, although only by thirty minutes, and a former naval officer, or perhaps especially for those reasons. As if to confirm my decision, the bow of the huge ship began to swing; not, however, to pass on the left, but in what was for an 80,000 ton vessel a violent turn to starboard. As we watched, the port bow, now towering high above our upturned gaze, continued its swing until the ship was broadside-on, with a full quarter of its length protruding from the channel. Liam was unconvinced. His attempt to point out that the quick-flashing, green buoy just ahead to starboard, had to be the Mucking Number One, which would leave Canvey Dock at least half a mile downstream, was obliterated by three anguished bellows from the container ship. Its progress slowed, then came to a halt. The Medway Merchant of Taipei Taiwan had taken the ground. The outraged voice of the grounded captain coming over channel 16 of the yacht’s radio, made a reply unnecessary. Captain Grimes was not to learn until some months later, that his new third officer was not merely nearsighted, but also colour-blind. Had he been aware that Kwang’s father was the Taiwanese businessman then in the process of taking over the company, he might have moderated his scathing comments about the young man’s ancestry and ability. Looking back over my shoulder, now somewhat less convinced of the quality of my seamanship, I darted a guilty glance toward the stranded behemoth, now fast fading to view in the golden mists. I did my best to ignore Liam’s accusations of incompetence by alternating my attention between the chart, and the channel ahead. Seeing he was having no effect, brother Liam rolled his eyes, snorted, and made his way forward, as one fleeing contagion. Whyteman, the builder’s rep, squinted toward the disappearing hulk his washy blue eyes blinking in satisfaction. “They’ll have to hustle to get that lot off,” he croaked, like an expectant crow observing road kill. “Top of the tide in fifteen minutes. Some lucky sod is going to pick up a bundle from this one.” When a bend in the river masked the last blurring evidence of the mishap, he ducked below to listen to continuing radio chatter between Medway Merchant and her rescue tug. I remained at the wheel for another two hours, idly observing my yacht’s progress decrease to a slow march against the ebbing tide; my mind drifting back over the events of the past two years. Not even the news that Medway Merchant had been successfully refloated could relieve my growing depression. This was not an auspicious beginning for my yacht’s maiden voyage, nor a boost to the confidence of her novice skipper. Ned goes to pick up his new boat and encounters great difficulties. Brother Liam comes to join him at Canvey Island, but becomes fed up with delays and goes home to Canada.